It seems mediocrity is the only thing that doesn't excite me these days. Unfortunately, there's a disproportionately large amount of it out there. In progressive rock especially, scores of bands are ultimately able to disguise their lacklustre art with flashy technique and production standards, and listeners are none the better for accepting it on surface value. Thankfully, one band that's never been able to get away with making a bad album is Yes- if the way the recently released and thoroughly disengaged mess Heaven and Earth has been panned is any indicator, fans of the classic prog outfit are quick to call out the band when they're undercooking their product. But when an album is as lowly rated and near-universally loathed as this one, I become masochistically interested in it. True to Victor Hugo's comment that "[t]he beautiful has but one type, the ugly has a thousand", anytime an album is held in such devastating poor regards, there must be something about it that shocks or offends, even if the effect is shallow. There's no such catharsis or rise in Open Your Eyes. Although it easily deserves the dubious pleasure of being considered the lowest point in Yes' discography, there's nothing about it that warrants heated debate or analysis. In the fallout of trying to redefine themselves in a post-Rabin career, Yes have fired a blank. An hour-plus of indistinct songwriting blown up with faux-prog orchestrations have resulted in a pretty joyless album. 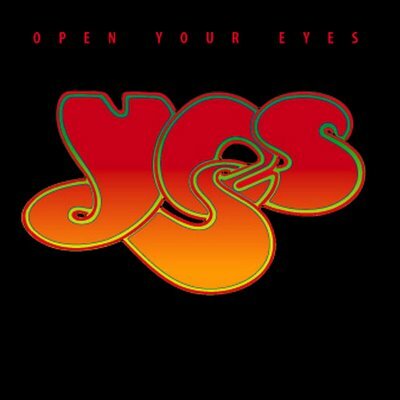 Even with the pathetic addition of "Heaven and Earth" to Yes' oeuvre, Open Your Eyes still stands as the most underwhelming, empty statement in their career. I suppose Open Your Eyes makes better sense when taken into context. It wasn't supposed to be a Yes album per se; rather, Chris Squire and the much-loathed personnel addition Billy Sherwood outlined this material for a new project. Whether it would have fared better with a different band is up for half-hearted debate, although I'm guessing things wouldn't change. The Keys to Ascension duology gave some strong hopes that Yes were going to push their career forward post-Rabin with some strong new material, but Open Your Eyes shows the band unsure of where they want to go. As much as I preferred Yes' prog side over the later pop, Trevor Rabin was a clever songwriter and leader for the band. In his wake, there is confusion. Yes obviously want to harken back to a proggier sound, but they lack the drive or ambition to push themselves past predictable songwriting. Unlike Rabin's contributions throughout the 80s and early 90s, you'll find very few interesting hooks or melodic lines on Open Your Eyes. What was it someone said about absence making the heart grow fonder? Style isn't the issue on the album, ultimately. Yes have let themselves fall into a disappointing AOR snag, but that's nothing new for them. The thing that hurts Open Your Eyes moreso than any other album in the band's discography is the songwriting itself. Even on the most disastrous albums (their latest one included), there were always a handful of tracks that stood out, at least a passage or two that stuck after the record ended. I would like to call "New State of Mind" and the catchy title track the highlights of the album (which they are), but those songs would have felt lacklustre even on Big Generator or Union. I'm up in the air whether the declawed anthem rock they're going for on Open Your Eyes is worse than the first half of Talk, but Talk at least offered the amazing suite "Endless Dream" to make the grinding worth it. There is no such redemptive value to enjoy on Open Your Eyes. Hell, I'm not even sure there are standout awful tracks either. I've listened to the album a few times now, and "Man in the Moon" and "Love Shine" do seem particularly moronic, but there's nothing that really seeks to offend or disgust. It's a boring, boring album, and the twenty minute loop of birds chirping that follows "The Solution" might have been a good ambient addendum, had it not been ruined by reprising vocal hooks from the album every 45 seconds or so, reminding me why the album does so little for me in the first place. It's such a goddamned frustrating thing when mediocrity metastasizes like this and becomes something nigh-unbearable. I'm left to wonder if I'm overreacting, or if my intolerance is justified due to the consistent lack of quality. Yet, Yes haven't broken any grounds of bad taste with this one, so I'm not even going to justify it by calling it one of the worst albums ever. By all means, it's not, but that's not to say silence wouldn't be more compelling.